Scheduled to be completed in fiscal year of 2014. Public sewer, or to drain to the exclusive drain pipe after processing by each company individually. 4.5 km, 10 minutes by car, to JR Imaichi station on JR Nikko line or Shimo-imaichi station on Tobu-nikko line. 2.5 km, 5 minutes, to the Dosawa interchange on the Nikko-Utsunomiya road. Nikko City Factory Locations Act １) Industrial districts prescribed by the City Planning Act, or Industrial promotion districts prescribed by the Rural Areas Industrial Introduction Promotion Act. 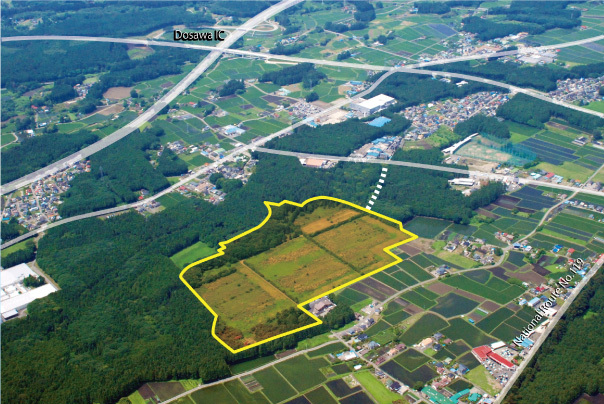 Land area of 5,000 m2 or more, or building area of 2,000 m2 or more. 10 or more employees, and 1/2 of them shall be residents of Nikko City. Manufacturing industries (excludes waste disposal industry), or other industries who can develop sophisticated industry by its location. ２)　Other districts not described in the above. Land area of 9,000 m2 or more, or building areas of more than 3,000 m2 and more, and recognized by the Mayor. Manufacturing industries (excludes waste disposal industry). However, the total grant amount of incentives is limited to 100 million yen( in case tax exemptions for fixed assets taxes are applied, deducts the equivalent exempted amount from the 100 million yen (an amount less than 10,000 yen shall be rounded off)), and the grant period of the incentives is until when the total grant payment reached the limit amount. Grant limit period: For 5 years.